What is Electroneum? The first cryptocurrency which is “mineable” with your smartphone. No need for expensive mining rigs and hardware. 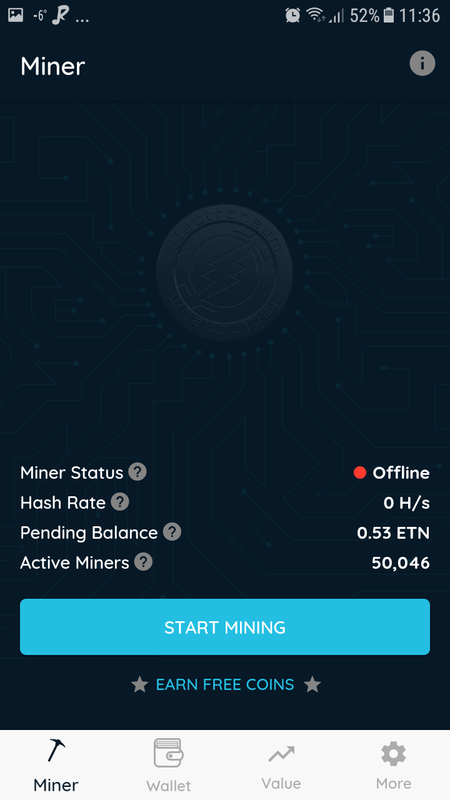 You can mine with your regular smartphone. You don’t need to have any knowledge about mining crypto, start mining with just a push of a button. (Creating an account with Electroneum can take time though and some patience is needed 🙂 ). But once you have created the account you click the button to START mining and you click the button to STOP mining. Your mobile phone doesn’t actually mine like a desktop miner would, instead the system will benchmark the device and allocate it with a hashrate that it would be able to achieve if it were actually mining. If your phone would actually mine, it will overheat very quickly and potentially damage the hardware plus it would kill the battery in matter of hours. So better your phone’s tech are, higher hashrate you would get which means higher reward from the “mining”. With my phone (Samsung A3 2017) I´m getting 13 H/s which has nailed me over 0,53 ETN in less than 24h. 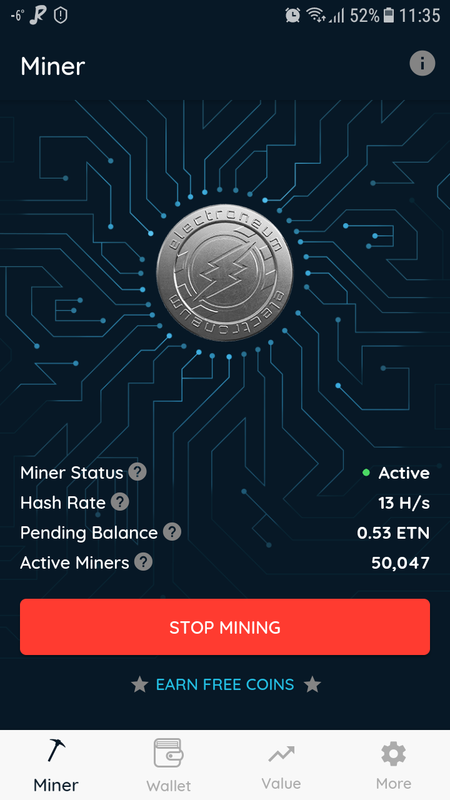 As Electroneum is the first coin which is mineable with your smartphone, it will introduce cryptocurrency to the masses. Everyone who has a smartphone can get their hands on this crypto. Currently there are about 10 million bitcoin users around the world but Electroneum will beat that number in no time. I have to also mention that Electroneum ICO (ICO meaning) was the biggest ICO at that time – Electroneum ICO sold 40 Million dollars worth of tokens in one month. Electroneum is already tradable in many exchanges and many more are coming in near future. Electroneum team has partnered up with many big companies which help Electroneum to go viral. You can read more about Electroneum and get to know the team behind it by reading their blog.